It is so kind and nice of you for regularly sending me quarterly issue of your popular periodical 'Sindhishaan' last being for July-Sept 2005. Thank you very much. 2. “Ulhasnagar” i.e. Sindhunagar grave and unforeseen situation (being faced by our brethren there we are with them). Other articles are also educative and informative. Dada Murijmal Manghnani's brief life story is quite interesting, an act of hard work and dedication indeed we are fond of him and his worthy son, Chander. They have contributed a lot and lot in one or other way for promoting and spreading fragrance of Sindhyat and helping the needy. 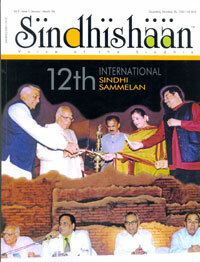 A chapter in Sindhi started and included in the magazine is all the more praiseworthy. Life story of our greater beloved saint Dada Sadhu Vaswani is very inspiring. Sunil Dutt's life sketch by Ram Jawhrani is well drawn. (Late) Balraj Dutt was my senior college fellow in Jai Hind College. Sahyog Foundation’s work & activities (Happenings) are laudable.